This is the small water jacket boiler that we often fit to our cast iron stoves. It needs to be fitted inside the stove, above the height of the rear flue outlet and replacing the baffle plate. The boiler will do the same job as the baffle plate by keeping the fire in the fire box and letting the smoke up the flue - but also creating heat to the wet side of the system as a by-product. A Stove must NOT be used with this boiler fitted if the water is not plumbed in. Therefore, only fit when you are ready to couple with radiators or hot water. A standard radiator is classed as 600mm x 900mm single rail convector type, and in an 8kw stove, in normal conditions it can feed four to five of such radiators OR a hot water tank and two single 900mm rads. 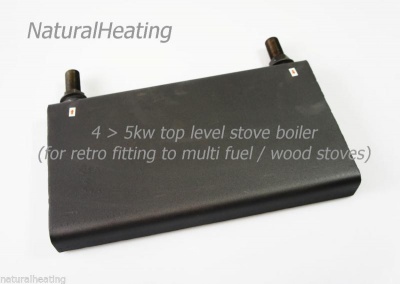 By purchasing this item, you will be supplied with the loose boiler and nuts / washers required to fit to the stove. You will need to have the holes in the cast iron cut to accept the boiler by a local engineering shop yourself or use a magnetic drill and diamond cutter. There are no instructions for fitting included as this may vary by stove model - SO PLEASE READ FOLLOWING INFORMATION CAREFULLY. We cannot offer technical plumbing or fitting advice for your stove and system other than contained in this listing. It heats water far faster than the type of boiler that runs vertically up the inside of a stove and replaces the back lining panel. This is because this particular style of boiler takes direct heat from the flames as well as keeping the heat in the full body of the stove. It is NOT suitable for a stove with a firebox body smaller than the following models (which you can find in our shop) : Trilby, Nuri, Buckingham, Coachman 8kw, Elite 8kw, Maid, Butler. It will NOT FIT : ACORN 6kw (or any 6kw stove), ASPECT, CROFTER as the fire boxes on these models are too shallow internally to fit the boiler and allow the stove and chimney to draw. We recommend you only fit this to a new stove. In stoves which have been in use for some time, the metal will be cured and hardened which gives a greater risk of cracking the cast iron when you cut the holes in the body. It can be done, but AT YOUR OWN RISK. The small boiler is likely to supply MORE to the wet side of the system than stated when fitted into larger stoves. 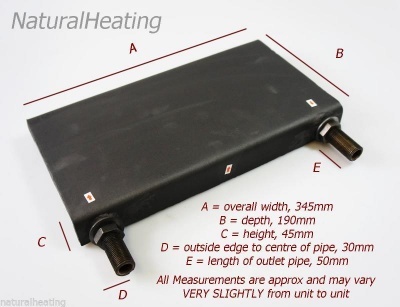 If the boiler is much smaller than the width of the original baffle plate, you will need to custom modify your baffle to fit WITH the boiler so excess heat is not lost up the chimney. It's very important with rads to fit a header tank and be aware that it may be necessary to fit extra rads if too much hot water is being produced.